Moving somewhere new is always exciting, but one thing's for sure – packing is not. It’s a long and tedious process, especially when you’re working with limited time. That’s why last-minute moving and packing tips are a must. As always, you said you weren’t going to wait until the last minute to start packing, but here you are without a packed box in sight. Hey, we get it. We all do it (some more than others). The good news is that we are here to help. So don’t waste a minute more feeling stressed about your move. Instead, focus your energy on getting down to business! There are plenty of solutions for last-minute moving and packing tips, whether it’s organization or utilizing some awesome packing hacks. With some prep, dedication, and the 10 tips below, you’ll be sure to clear out your home quickly, and safely move your belongings from point A to point B. This last-minute moving tip is essential and will set you up for success further down the list. 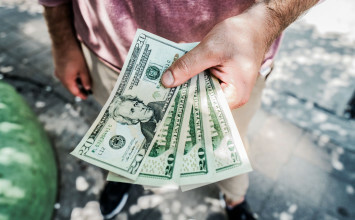 Before you get down to business, take a walk through your home or apartment to assess items that you’ll definitely want in your new place — versus items you might leave behind. Make three lists in an effort to keep yourself organized: Pack, Donate, and Trash. Create these lists on whatever is convenient for you, whether that’s a notebook or your phone. Write down everything that needs to be done, packed, donated or thrown out. 2. Get an early start. If the sun is up, you should be too! This might not be the most obvious last-minute moving tip, but trust us. Get an early start to your day and spend it packing and organizing your belongings. You may not be an early bird, but you will not regret getting a head start on tying up the loose ends of packing. It will not only allow you to finish up what you weren’t able to the night before but will also allow you some time for last-minute and unexpected tasks. Take a second to think and make sure you haven’t lost track of any items that may fly under the radar like a phone charger or jewelry. It’s easy to overlook some important items you’re not going to want to forget. When you get an early start, you’re allowing yourself the time to stop and take a minute or two to double-check your lists and make sure everything is ready to go. And if it all goes smoothly, you might even have extra time to stop and take a breather, or not. But honestly, the best time of the day to move is always the morning. We highly recommend it. It’s hard to overlook this last-minute moving tip. Without supplies, where does that leave you? Save yourself wasted time looking for the packing tape and scissors and gather all of your packing supplies together in one place. Gather boxes in different sizes, packing paper, bubble wrap, markers, box cutters, and labels. Purchase boxes and packing supplies ahead of time. Having easy access to these items will make packing easier. Even if it’s late the night before, you need to make sure that you have all the necessary supplies. Nothing open? Hit up your local convenience store, 7-Eleven, or bodega. You’d be surprised by the number of boxes and newspapers that these businesses are willing to part with for free. They might even take pity on you and throw in a free roll a tape. Often times, the thought of packing your entire house or apartment into boxes and bags can be overwhelming. That’s why this next room-by-room last-minute packing tip will help streamline your move and ease your mind. Instead of diving in head first and running from one end of your home to the next and then back again, focus on packing one room at a time. Going room by room can greatly increase your productivity and help get the job done fast. Another trick of the trade? Start big and end small. Start with communal spaces such as living and dining rooms, then move into bedrooms, and finally finish with bathrooms. Packing up your smaller rooms last will keep you motivated, making last-minute packing less stressful. And when you're down to the eleventh hour, it’s all about keeping your sanity. 5. Use ALL space that is available to you. Often overlooked as a last-minute moving tip is using all of your belongings — packing smaller items directly into larger ones. You heard that right. Pack smaller items such as fabric duffels into larger duffels. You can even go a step further, by bypassing the use of boxes to pack clothes in and place clothing directly into duffels. You can even place that same duffel into a larger one. Mind blown? We thought so. In addition, those suitcases – fill ‘em up! Bonus: they’re on wheels. When you utilize larger items to pack smaller items, you end up saving yourself time and energy. Instead of moving five items, you could be moving two. 6. Use trash bags as the ultimate last-minute moving tip. Trash bags make packing items like towels, blankets, and clothes easy. Simply throw some non-fragile items into a trash bag. Often, they hold more than boxes. If you plan to pack with trash bags, keep in mind that you should buy a strong and sturdy brand so you don’t end up with your clothes or bed sheets all over the street. One last thing, in order to utilize this particular last-minute moving tip, you need to be careful of how your bags are (or are not labeled). Trash bags are most of the time used for, well, trash. In the commotion of moving, you don’t want a mover, a family member or even yourself to accidentally confuse these bags for trash. Mark them a few places with a magic marker or attach ribbons to the top to distinguish them from trash bags that you will be throwing out. Better yet, use clear garbage bags! 7. Leave clothes on hangers. A quick and effective last-minute moving hack is to leave your clothes on hangers. You can then lay them flat in the trunk of a car or place them inside of a trash bag with the hangers sticking out. This also makes your life easier when unpacking. Because what’s easier than simply hanging your clothes in your closet? 8. Use recyclable moving bins. Using recyclable moving boxes can be an efficient way to help you pack quickly. Though you won’t be able to get them at midnight the night before you move, if you plan just a few days ahead, they can be incredibly helpful in your move and save you a ton of time. Once your items are packed and ready to go, they can be moved anywhere, whether that's around town or across the country. These units are safe and secure and are designed to make moving and storage as easy as possible. Why will they save you time, you ask? No assembly required! That mean no hassling with folding and taping up boxes. 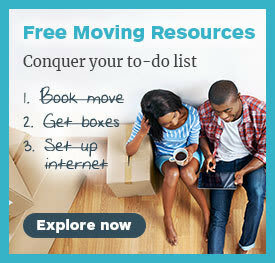 They’re a last-minute moving tip we’ve been dying to share! Use professional packers. This puts an end to the misery of packing for those who can’t stand it, which honestly, is most of us. Hire them to pack your entire home or just a few rooms that might take up a lot of your time. Again, this isn’t exactly a last-minute moving tip you can execute the night before. If you’ve moved enough times, however, and know that you always run out of time, this is probably an investment you’ll want to make. Oftentimes, the biggest regret when moving is not asking for, or hiring, help. Hiring professional movers is a great time saver for last-minute packing. Most Updater Certified Moving Companies offer packing services. 10. Ask (or even beg) for help. Speed up your packing process, and have some fun with it, by asking friends or family to help you get your last-minute packing squared away. A pizza, a beer, and a hug are always appreciated. Enlisting friends and family also gives you more time to spend with them before moving to your new place, whether it’s down the street or across the country. Bottom line, it never hurts to ask for help. Well, there you have it. 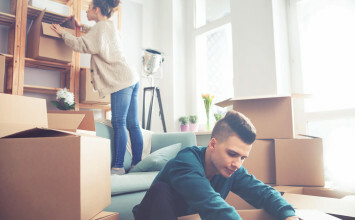 So, if you’re moving tomorrow, don’t panic – using these 10 foolproof last-minute moving and packing tips are sure to have you out of your old place and into your new home in no time. Stay focused and dedicated to your goal. The excitement and thrill of moving day should keep you motivated to get packing and get moving fast!